I have been interested in building an airplane ever since getting my pilot’s license. 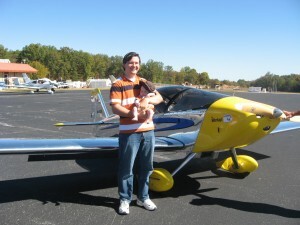 For a long time I considered building the RV-7, but was looking for something less expensive and easier to build. The Sonex seems to be the perfect fit for me, so I emailed a local Sonex builder and heard about a Sonex fly-in in Crossville, Tennessee. The fly-in was great. It was wonderful to see all the airplanes and talk to builders about the building process and their flying experiences–especially their experience with the 80hp VW conversion Aerovee engine. Part of what appeals to me about Sonex is this ~$7000 engine, but I have been concerned about not having enough power to tow me and a friend around. I have heard about saving weight by polishing the aluminum instead of painting it (20-30lbs) and building the tailwheel option instead of the tricycle (~10lbs?). While there, a couple airplanes built by Tom Huebbe and his son caught my eye. They had the most beautifully polished aluminum I could have imagined and the decals looked ridiculously stylish. But most importantly, they are also powered by VW engines–I figure if they can have this much fun, it should be good enough for me. I had been afraid polished aluminum would feel like a compromise, but now it seems like the only way to go. Be sure to check out their videos–they are every bit as artistic as their airplanes. Also while there I noticed Aaron Knight’s color-changing Jabiru 3300-powered Sonex. I recognized it from his youtube videos and have since discovered his website. Check out his videos–my understanding is he wrote the music, I wonder if he plays his own theme song while he flies?